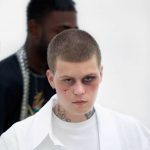 Artist: Yung LeanVideo: “Friday the 13th”Why You Want to Watch: Swede Yung Lean gets his wings in this Ingmar Bergman-esque video directed by Suzie Q and Leo Siboni, a French duo who has worked with Yung Lean on previous videos. Also collaborating with Yung Lean again is Director of Photography, Erik Henriksson. Nice work!